First off, ADO buses are generally well priced and incredibly comfortable, and depending on the class level they have at least one bathroom in the back of the bus. 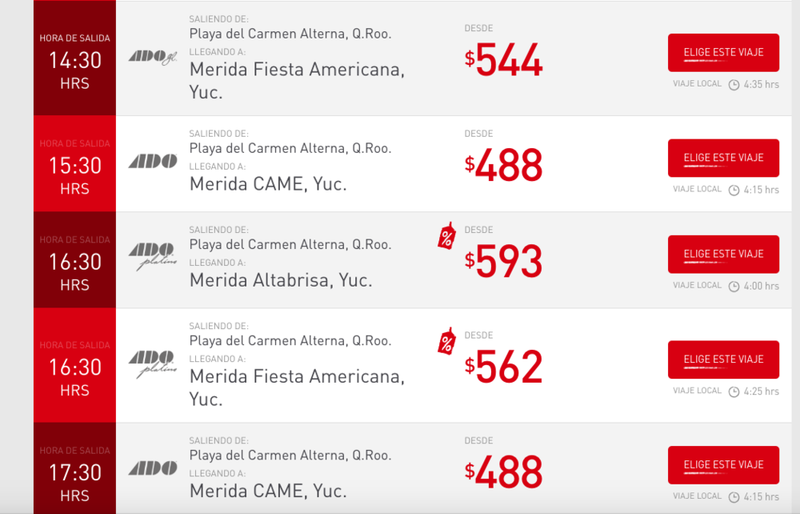 You can search timetables on the ADO website, however it’s only in Spanish. That being said, we only know a few words of Spanish and managed to figure out it, so it can’t be that difficult! From a drop down menu you pick your origin, the next dropdown is destination and then the date. When the results come up they’ll be listed from earliest to latest buses. The first column is the departure time, the second column indicates the class level (more about that below), the next section tells you the origin and destination- followed by the price- and lastly, under the red button is the length of travel time (definitely pay attention to this- we always try to look for the least amount of travel time for the best price). If you have a foreign credit card (like us), you won’t be able to purchase your bus tickets online. Hopefully they change that soon, but for the meantime you have one, possibly two options. The best option is going to the ADO station and buying your tickets in person. We’ve never had any issue with this, even in high season, although we have heard of certain routes selling out. You can purchase your tickets at any time, from any station, so if you’re worried about your route selling out (this typically only happens in very high season/holidays), we’d highly suggest you go as early as possible and purchase your tickets. However, if your route has many buses and options each day you should be fine to purchase your ticket the day of. Keep in mind that line ups can get quite long so don’t wait until the very last minute or you could end up missing your bus. Most stations take cash and credit cards but we have encountered a few that only take cash. The other option we honestly have yet to master. Download the ADO app to your phone. Do a search the same way you would on your desktop. Go through the booking process (we had to use google translate here and there but it was relatively straight forward, asking for names, email, etc) and pick your seats. The first time we tried this I was able to go back into the app and still see my reservation. However, when we arrived at the station to pick up and pay for our tickets we found that they were no longer held for us- the key is you have to be there at least TWO hours in advance to get your tickets. Thankfully our bus wasn’t even remotely full so we just picked other seats. The second time we tried to do this, we went through the same process, got to the station way more than two hours before departure, yet when we went to pick up our tickets I couldn’t find the reservation anywhere in the app, it just seemed to disappear. Again, there was lots of room on our preferred bus so it wasn’t a problem. As many of the people working the kiosks don’t speak much English, one thing we would suggest is going online first, picking your preferred bus and then writing down the origin, destination, date and departure time. This would be especially helpful if you’re booking a bunch of tickets at once. Bus photos curtosy of ADO. ADO- this is the regular 1st class service. Very comfortable seats that have quite a bit of recline, one bathroom, and a movie playing on the overhead screens. ADO GL- this is the next level up, or Deluxe service. The seats offer even more recline, there are separate bathrooms in the back as well as a coffee machine, and movies play overhead but you’ll need headphones to listen. 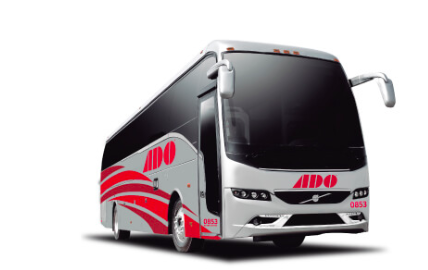 ADO Platino- These are the highest level of buses. 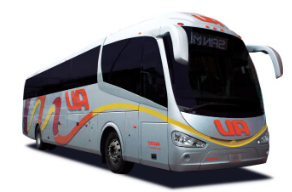 Great if you have any overnight journey, you’ll be in ultimate comfort in these buses. The seats fully recline, and you’ll have your own entertainment system as well. The lowest level is AU- we’ve never travelled on these buses and honestly don’t intend to as we’ve heard they aren’t particularly comfortable- so we can’t speak from experience. It’s always key to get on the correct bus! Normally the bus driver double checks your ticket with a master list as you board the bus. However, once, we boarded only to find someone already in our seat, she didn’t speak a word of English so after a few minutes of complete confusion we discovered she was in fact on the wrong bus, so clearly the driver wasn’t checking that closely. The front of the bus will always say the final destination, but that’s not always helpful. There’s usually staff members around to ask if you aren’t sure which bus is yours or if it’s arrived yet. It’s definitely more confusing in the bigger stations. We’ve absolutely been those annoying people who continually ask the staff if this is our bus and we’ve never got on the wrong one or missed a bus! 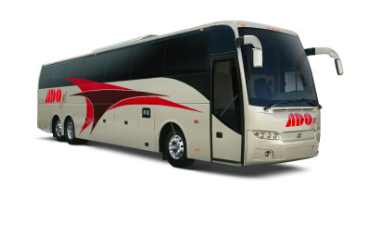 When you do find your bus, there is typically someone loading luggage into the compartment by destination. Often they’ll give you luggage tags but not always. We’ve never had any issues with our luggage underneath but we’d always advise you to keep valuables with you on the bus! Once on board, find your designated seat (they’ll always be assigned), stow luggage overhead and get comfortable. Once in awhile we’ll hear horror stories of someone have bags stolen on buses. We’ve never had even a minor issue or seen anything remotely concerning. We’re guessing this happens more so on lower class buses that get really packed. That being said, always be aware of what’s going on around you and keep an eye on your things, especially when making stops! Take the ADO to Tulum to discover this amazing beach. All prices are listed in Mexican Pesos. Times are listed in a 24 hours. Buses tend to be cold, bring layers! We are by no means experts of the bus ADO system. 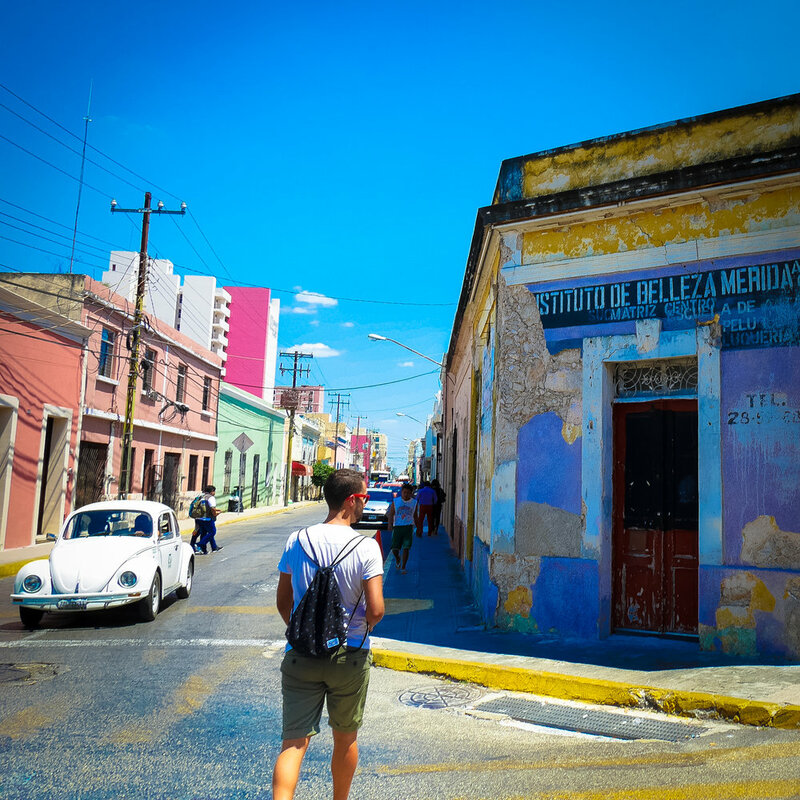 But we have used it successfully enough times now to feel very comfortable with it, and therefore decided to write this post in order to pass on our accumulated knowledge and help out as much as we can! Ask us any questions below and we’ll do our best to answer!